The global economy is like a jetliner that needs all of its engines operational to take off and steer clear of clouds and storms. Unfortunately, as Nouriel Roubini tells The Guardian, only one of its four engines is functioning properly: the Anglosphere (the United States and its close cousin, the United Kingdom). AsRoubini continues, the question is whether and for how long the global economy can remain aloft on a single engine. Weakness in the rest of the world implies a stronger dollar, which will invariably weaken US growth. The deeper the slowdown in other countries and the higher the dollar rises, the less the US will be able to decouple from the funk everywhere else, even if domestic demand seems robust.But it's not just the rest of the world that is decoupling from US growth... as the following uncomfortable chart shows, so is a crucial pillar of monetary policy transmission, consumer wealth perception, and economic stability - the US housing market itself. For the moment, at least, Barclays notes it appears that the momentum of the U.S. and the rest of the world will continue to move in different directions. The end of QE could create risks for credit, but the divergence in growth suggests that those risks are likely to be experienced more keenly outside of the U.S. Private and public debts in advanced economies are still high and rising – and are potentially unsustainable, especially in the eurozone and Japan. Rising inequality is redistributing income to those with a high propensity to save (the rich and corporations), and is exacerbated by capital-intensive, labor-saving technological innovation. This combination of high debt and rising inequality may be the source of the secular stagnation that is making structural reforms more politically difficult to implement.If anything, the rise of nationalistic, populist, and nativist parties in Europe, North America, and Asia is leading to a backlash against free trade and labour migration, which could further weaken global growth. Rather than boosting credit to the real economy, unconventional monetary policies have mostly lifted the wealth of the very rich – the main beneficiaries of asset reflation. But now reflation may be creating asset-price bubbles, and the hope that macro-prudential policies will prevent them from bursting is so far just that – a leap of faith. Fortunately, rising geopolitical risks – a Middle East on fire, the Russia-Ukraine conflict, Hong Kong’s turmoil, and China’s territorial disputes with its neighbors – together with geo-economic threats from, say, Ebola and global climate change, have not yet led to financial contagion. 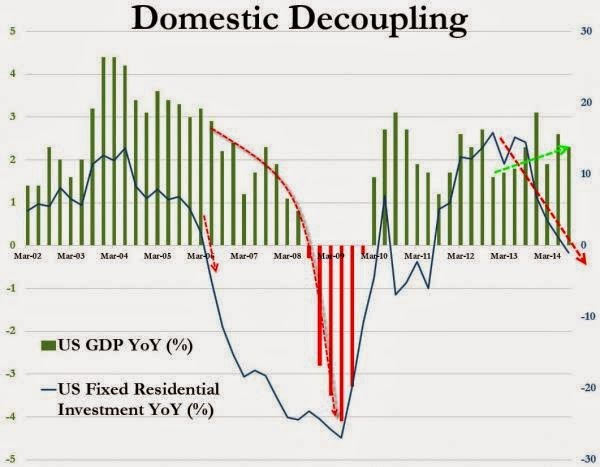 Nonetheless, they are slowing down capital spending and consumption, given the option value of waiting during uncertain times. So the global economy is flying on a single engine, the pilots must navigate menacing storm clouds, and fights are breaking out among the passengers. If only there were emergency crews on the ground. At some point very soon the dollar is going to break out and EVERYTHING you know is going to change. Everything you’ve understood to be normal and stable in your investment portfolio is going to be as risky as hell. All of your core assumptions are going to be tested and thrown out as false assumptions. Yield trades, once the safe haven, are going to kill you. Anything that has any carry element or any exposure to currency moves will create huge losses. Why am I so damned alarmist? Well because as ever, we’ve seen it all before. The reason it is going to happen rapidly and maybe in a disorderly fashion is because if the dollar moves much higher, we will begin to see an unwind or THE unwind of the biggest carry trade in history. This is the flip side to all that QE. This is the flip side to the China miracle too. Multiple trillions of dollars are going to need to be bought or extinguished in this unwind, and that is going to create complete chaos. Sadly, there is no such thing as free money in the real world. There is always a price to be paid. Self-reinforcing virtual circles eventually become the spiral of doom. I think we find ourselves at the tipping point of the spiral of doom.